While I know it has been dry and warm through much of the U.S., here in Colorado, it has been snowy and cold and it's looking like northern Colorado will have a white Christmas! Last night we had a couple inches of snow to top off the 13 inches we had last week. So fresh and beautiful, especially when I don't have to drive to Denver and back in it! It was a perfect opportunity to get outside and take some lovely wintry photographs! 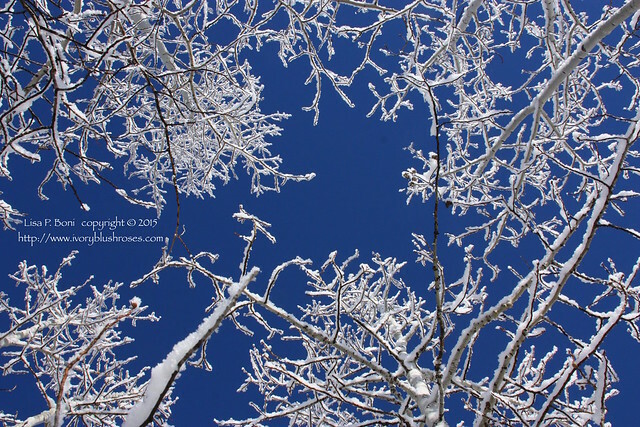 For a brief while, the skies cleared and the snow covered branches were like enormous snowflakes against an impossibly blue sky. Just amazing! 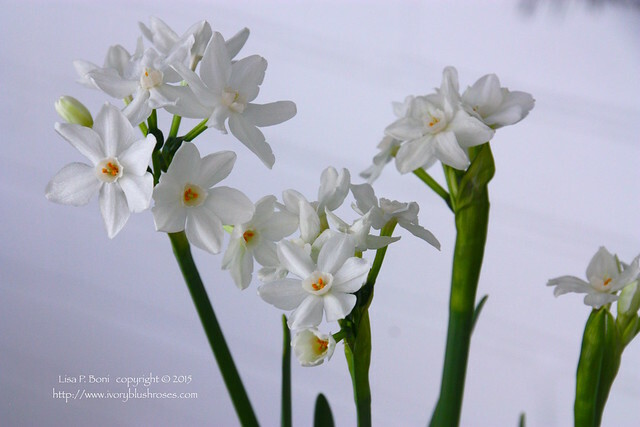 Inside, the first pot of paperwhites are blooming. Their scent, mingled with that of pine smells like Christmas to me! 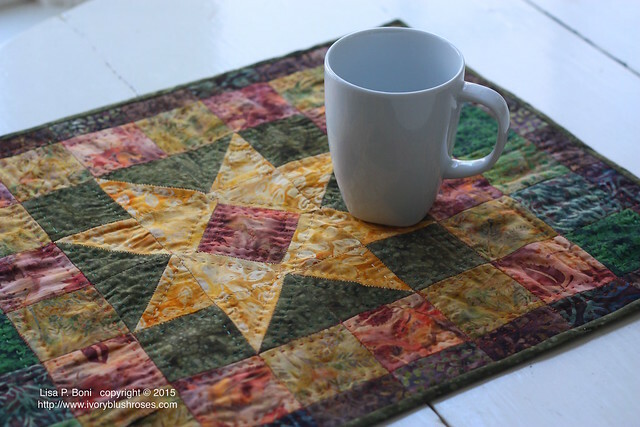 I finished a bit of Christmas stitching... a large Mug Mat for my brother in law! Since he doesn't read my blog, I can share it here! Though I'll be working through the holiday, I've had a lovely week off leading up to Christmas. It's been peaceful and restful, something I desperately needed. It was also filled with lovely things such as seeing a wonderful performance of The Nutcracker Ballet by the Longmont Dance Theater (which my DIL Marcy works for! ), seeing the new Star Wars movie with my daughter, and lots of fun stitching per the request of two of my sons, which I'll share after Christmas! Thomas has loved having me home and we've had lots of good snuggles in the big chair in the evenings. 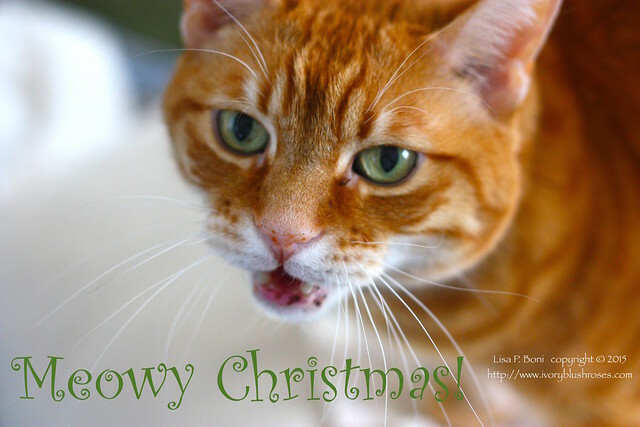 He talks to me constantly and so I leave you with this fun photo of Thomas wishing you all a Meowy Christmas! Love the photos of your snow covered branches. Beautiful! Your stitchery is wonderful too. Love, hugs and peace this Christmas and may 2016 be a very good year. It will definitely be a green Christmas here. Yesterday it was 15 degrees Celcius here - absolutely ridiculous for this time of year. I don't like winter, but this is not the way things should be. 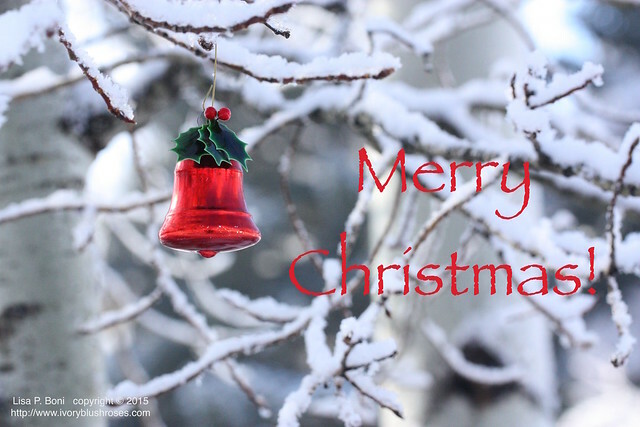 Enjoy your snow - and a very happy Christmas to you. Dear Lisa! Merry Christmas! For several years, I and my daughter Kate reading your blog. Wonderful pictures, unusual ideas and infinite kindness. Thanks for all. God bless you. Merry Christmas Lisa, I have missed being able to retreat into the pages of your life, artistic treasures and wonderful home. I hope 2016 will be peaceful, joyful and satisfying for you. Thank you for taking so much time to sharing all that you do! Wonderful photos! The blue sky and trees is breath taking. Wishing you a beautiful last week of 2015.